The invasion was not just reckless. It was unconstitutional. It is time to set the record straight. The United States Congress never voted for the Iraq war. 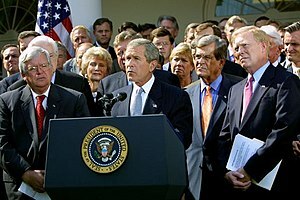 Rather, Congress voted for a resolution in October 2002 which unlawfully transferred to the president the decision-making power of whether to launch a first-strike invasion of Iraq. The United States Constitution vests the awesome power of deciding whether to send the nation into war solely in the United States Congress. My brother’s recent comments spurred me to find the article linke above about the unconstitutionality of the Iraq war. It’s an interesting read.